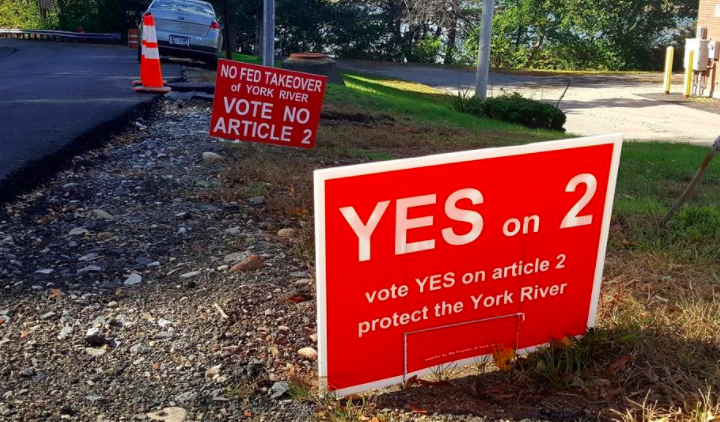 Signs in York advocate for "Yes" and "No" on the local referendum Question 2. At issue is a ballot measure that seeks voter approval to do essentially two things. 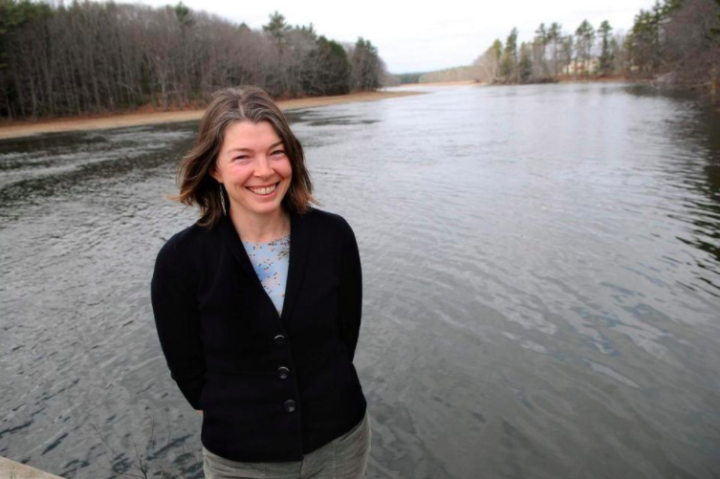 The first is to accept the 135-page York River Watershed Stewardship Plan, an advisory plan crafted by a study committee of residents in the watershed towns of York, Kittery, Eliot and South Berwick. Voters will also be asked if they want the river to be designated a federal Wild and Scenic Partnership River. Question 2 has many proponents, who say designation will ensure the York River will remain the pristine river it is today even as invasive species, sea level rise and other environmental threats chart an uncertain future. But a vocal group of opponents have myriad concerns, chief among them the fact the federal government via the National Park Service will be involved in the management of the York River. The York Weekly provides an analysis of what is behind the language in Question 2, as well as comments from those for and against the measure. The Wild and Scenic Rivers Act was passed by Congress in 1968 as a means to protect rivers that ran primarily through federal National Park Service, U.S. Forest Service and Bureau of Land Management property. But “we always envisioned other opportunities out there,” said Jamie Fosburgh, resource planner at the National Park Service. 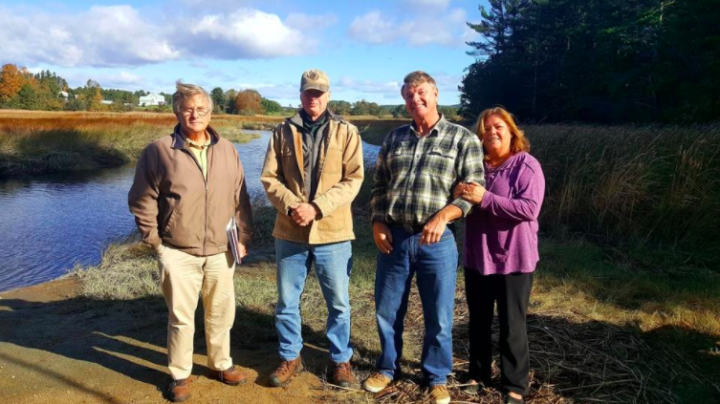 Fosburgh has been involved in all 13 partnership river plans in New England. By 1986, language was included in the original act to allow for this new partnership model. Under its terms, a group of local residents first study the river to determine whether it meets criteria to be a designated wild and scenic river. In York, this study committee just completed its work, voted unanimously that the river was worth designation, and wrote the stewardship plan up for voter consideration Nov. 6. The plan then wends its way before voters, then before Congress, before it is accepted into the program. Fosburgh said each plan is advisory in nature and tailored to the river. It is “is a master blueprint about what is important for the river. There’s a menu of things that could be pursued.” Local municipalities are free to adopt or not adopt the recommendations in the plan, he said. Jennifer Hunter, coordinator of the York Wild and Scenic River Designation Committee, stands at Scotland Bridge in York. The York River plan, for instance, zeroes in on three specific areas for further study and possible local action: the river’s historic and archeological significance; its natural resources; and community issues including recreational use and preservation of the working waterfront. There are two “key provisions” included in every Partnership Wild and Scenic bill that comes before Congress, Fosburgh said. One prohibits the forced sale of private land for conservation purposes, called “condemnation.” The second, he said, requires the river to be managed according to the study committee’s plan. “Those provisions are in all of the 13 partnership river acts,” he said. The National Park Service absolutely plays a role in this agreement. Fosburgh and another NPS planner were ad hoc members of the study committee and the NPS will be at the table if the York River is designated wild and scenic. He said its role is twofold: it will “assist and advise” a new local stewardship committee that would form after designation; and it would help the committee to secure federal grants to conduct further studies. “The most important thing to understand is that the NPS is not going to control or dictate anything after designation. That’s probably the hardest thing for people to grasp” because it is a federal program, he said. In fact, he said, since the York River Study Committee formed 2.5 years ago, the river has been temporarily under the protection of the Wild and Scenic Rivers program. “And the town hasn’t seen the feds telling them what to do for the past couple of years,” he said. Sherman joined Birch Hill Road residents David and Sharan Gross, daughter Amanda Bouchard and resident Michael Dow in sharing their thoughts about what they see as the flaws in this designation. Key among their concerns, they are opposed to what they see as another layer of bureaucracy dealing with the York River — particularly one that has a federal employee at the table. Further, said Dow, the study committee did not do enough outreach to property owners in the watershed as the study progressed. While the committee held public meetings and forums over the years, chairman Chuck Ott agrees if he had to do it over again, he would make sure the committee made even more efforts to zero in on these land owners. Opponents of the local Question 2 in York include, from left to right, Richard Sherman, Michael Dow and Dave and Sharan Gross. And they worry that use of the river, already a destination for many kayakers and other paddlecraft, will explode with a Wild and Scenic destination, because some people zero in on wild and scenic rivers when making vacation plans. 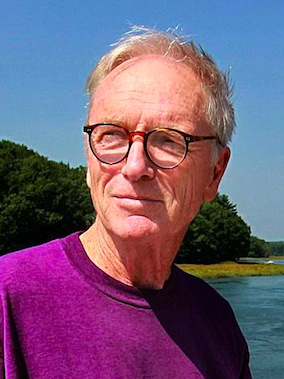 “We don’t want the upper reaches of the river to become an attraction,” said Dave Gross, in part because wildlife is often spooked by the presence of people. “Fair enough,” said Ott. The committee discussed what designation might mean in terms of increased use. But he points to a Harbor Board survey that showed paddlecraft use tripled between the summer of 2017 and 2018. “The people are already here,” he said. “And we’ve consulted other Wild and Scenic rivers and they have not reported an influx of new users because of the designation.